How the story of a Pianist could start an appreciation revolution in the workplace. A heartwarmingtale of a kind-hearted pianist has led me to call for an appreciation revolution. Instead of leaving the morale-boosting to those in management, if everybody begins to encourage others at work, we can all be part of something amazing. Recently I was fortunate enough to hear a story which got me thinking about how we encourage others at work. Traditionally, we tend to think of workplace encouragement as a leader’s responsibility but it’s something we all can do as we go about our day-to-day work. And, in doing so, we can change how our colleagues feel about themselves, the company and the work they are doing. Once upon a time, a family took their young music-loving daughter to a concert given by a world-famous pianist. When they arrived, they got chatting and their daughter wandered off. As the audience sat down, the family could not find their daughter anywhere but, when the curtain rose, there she was on the stage, sitting at the piano, playing Twinkle Twinkle Little Star with just one finger. The audience watched with interest as the famous pianist they had come to see appeared on stage. He watched for a while but no-one was sure what would happen next. The little girl’s parents wondered if they should collect her; the stage manager appeared and asked the pianist if he should take the girl off the stage. Everyone watched as the pianist sat next to the girl. He started to offer words of encouragement and then began playing alongside her, adding to her performance. What an amazing experience it was for that little girl – and you can imagine the love the audience had for the pianist. We never know for sure the impact we have when we encourage others at work, but we certainly know how it feels to be on the receiving end of the Pianist Effect. A compliment, some encouraging words, a simple act of kindness like a door being held open for us, an unexpected gift, being listened to… these all help us know we are appreciated and can totally turn our day around. Like me, you may even be able to trace many of your accomplishments back, at least in part, to the boost you received from some kind words freely given. As I thought more about the little girl’s story, I remembered who my pianist was. He was a wonderful manager who showed his belief in my abilities by giving me some amazing opportunities. He guided me to achieve things I never believed possible. He was challenging and demanding and always encouraging and supportive. I loved working with him and am incredibly grateful for the generosity and kindness he showed me, as well as the personal and career growth I experienced while working with him. He then went on to totally change the course of my career with a thank you note – a small act which was so typical of him. He thanked me for all I had taught him. My mind was blown; I thought it was him who had been teaching me. This was a final and lasting lesson from the person who had allowed me to discover the true power of coaching and had shown me I could add value through dialogue and with my thoughts and ideas. It would be all too easy to unknowingly be that stage manager and take someone away from something they love, but I am striving to be more of a pianist and I am inviting you to join me on that journey. If one small act of encouragement can make someone’s day, imagine the effect of several! How amazing would it be if to encourage others at work became the norm? As we strive to be a pianist, sometimes we will play alone, sometimes in an orchestra but we know that our act of encouragement will always hit the right note as we show our appreciation for those in our working world. Let’s keep a kind and encouraging tune in our hearts and minds. Let’s play our tune quietly all the time – and then really dial up the volume when we are with those who seem to be in a negative place. Who are you going to encourage today? What kindness can you show? 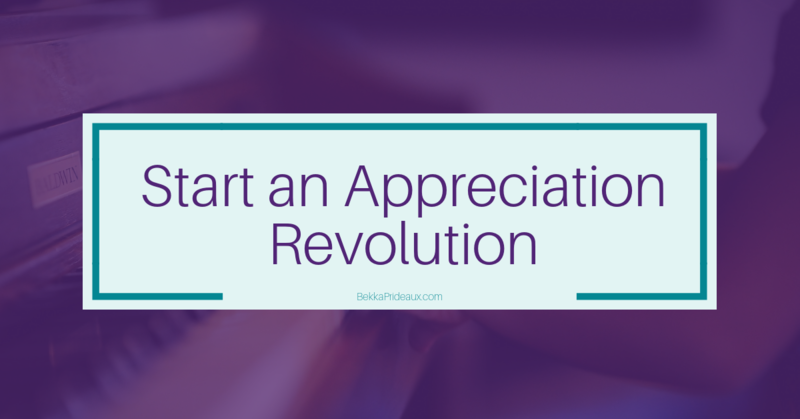 How will you show your appreciation for people at work?